The vast majority of our clients (I would guess at least 90%) see the appropriate translation of their industry and company-specific terms as one of the most important elements of every localization project they undertake. 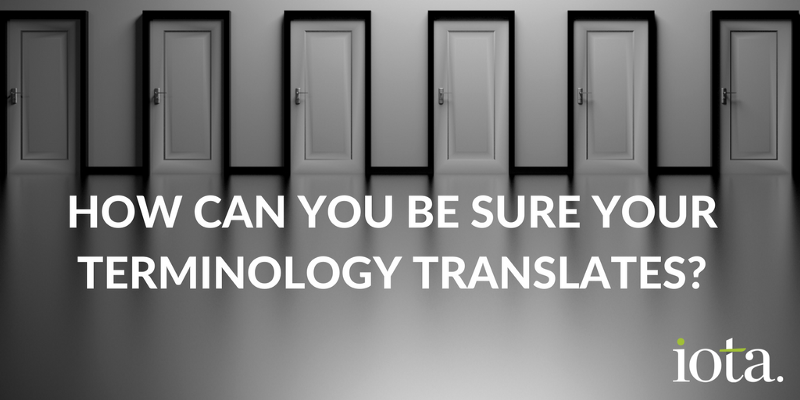 Apart from carefully tailoring the selection of translators to match the terminology needs of the job at hand, the best localization providers will collaborate with their customers to produce comprehensive terminology guides and “termbases”. A termbase is a list of English and translated key terms that allows translators to establish a style and consistency to their translations, so localised content is smooth, flowing and follows a consistent pattern. Termbases also allow multiple translators to work simultaneously on large pieces of content as they can all access the same terminology resources from within the translation tool they use. Language Dictionaries. For all major languages reference lists exist outlining the proper terms to use for common words and combinations. Termium Plus for example is the Canadian governments’ reference source to help translators with French Canadian translations. Broad Industry Standard Terms. Many companies might, for example, insist on using Microsoft terminology where applicable across all of their content. These terms are widely and easily available and are used by many companies across millions of pieces of content. The terms in these resources run into the tens of thousands. Industry Specific Terms. Each major industry often has a list of commonly used terms that can/should be used across content relating to that industry. For example in ERP terminology one could choose to use the SAP reference facilities to find translations for commonly used ERP terms. Company Specific Terms. Sometimes a company will have a particular meaning for a term that needs to be accurately reflected in their translated content. The translation reflects their unique position in the industry or their unique application of a term. The word “account” for example has a common translation in Italian (“conto”) which is not suitable for the purposes of Salesforce, a world leader in their field, who have chosen the English term to properly reflect the meaning of a sales account in Italian. Local Office Preferences. Occasionally local office experts determine the translations for certain terms. These choices can often be un-orthodox to established translators but it’s vital that this input is known and implemented in translated content. A good termbase will have all of the detail required for the term. Not only is the source and target language term listed, but also the provenance of the term — where it occurs and what it means in the source language (usually English), the source of the translated term (industry glossary, government dictionary, pioneering company term, company specific term, local preference, etc…) and finally a comment qualifying the choice. Any changes to the termbase need to be made only with the consultation of the vested parties in the content organization which includes developers (on occasion), product management, localization and the local office. Whether we work with you or not we’re always happy to advise on terminology or any other localization issue that you need a fresh perspective on. Call or email us with no obligation.